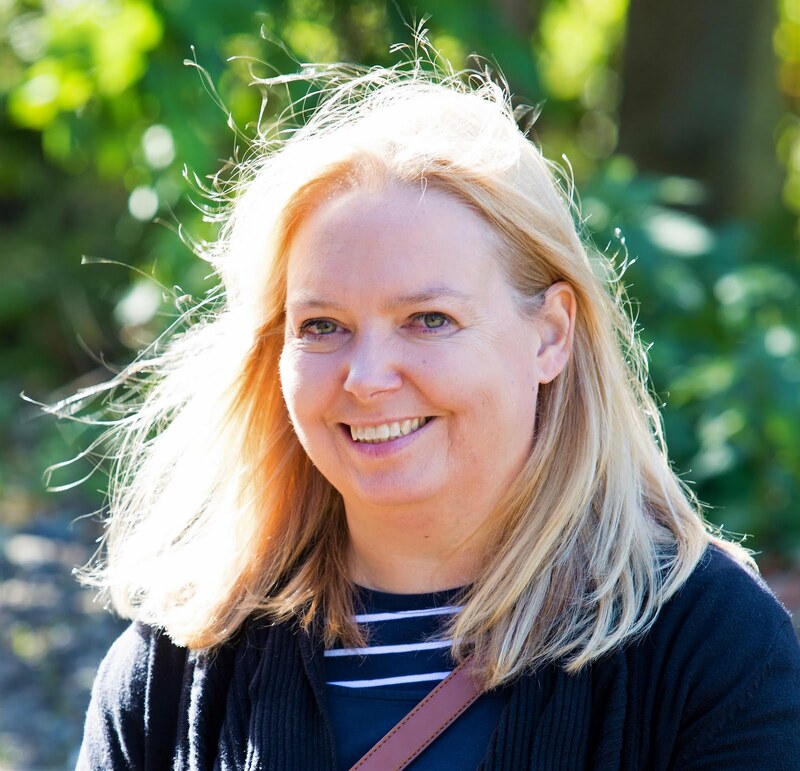 Every few months I head out without the boys or hubby and enjoy a foodie themed evening with a bunch of mum friends whom I've known since the boys were at nursery. 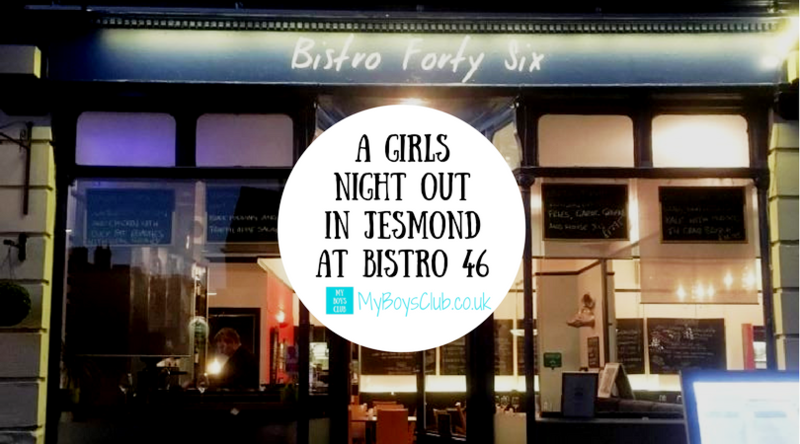 On this occasion, the destination for our eating out was to be Bistro 46 in a suburb of Newcastle called Jesmond - a place I'd heard good things about but had not actually been to. A friend booked our table as she'd been there the previous week and highly recommended the food so we were really looking forward to the evening. The day started really well. I tweeted the restaurant that I was looking forward to visiting and they offered us a free glass of Prosecco on arrival. Now that is customer service, and much appreciated. And I'm glad to say the evening didn't go downhill at all, the evening, food and drinks only got better and better. We'd met for a pre-dinner drink at The Lonsdale. It was a really warm summers day and luckily we got a table outside to enjoy the evening sun before walking under the Metro line and on to Brentwood Avenue. At one end of Brentwood Avenue, there is a row of a few restaurants, one of which is Bistro 46. There are tables and chairs outside, however, these were all taken and our table was reserved inside. At this point, we were the only people sitting inside. It is not a large restaurant - more cosy and intimate - is how I'd describe it. It was very warm and the air conditioning was not working but actually, it felt like we were on holiday. It wasn't too hot though and the sun was shining so bright that we wore sunglasses for some of the night even though we were sitting inside - and not to try and look cool either! The decor is modern and fresh, it even had a chandelier made out of wine glasses - not that I'd want to be the person who has to keep it dust free. We drank our much-appreciated Prosecco as we perused the menus. It's not a large menu but included meat, fish and veggie dishes, and in addition, there were also Specials on offer. I am a great fan of Seabass so I thought I'd try the Bistro 46 dish out. It was Pan Fried Seabass, with Kale & New Potato Hash, Crab Bisque & Hand Picked Mussels - I not keen on mussels so I asked for it come without, and it did. 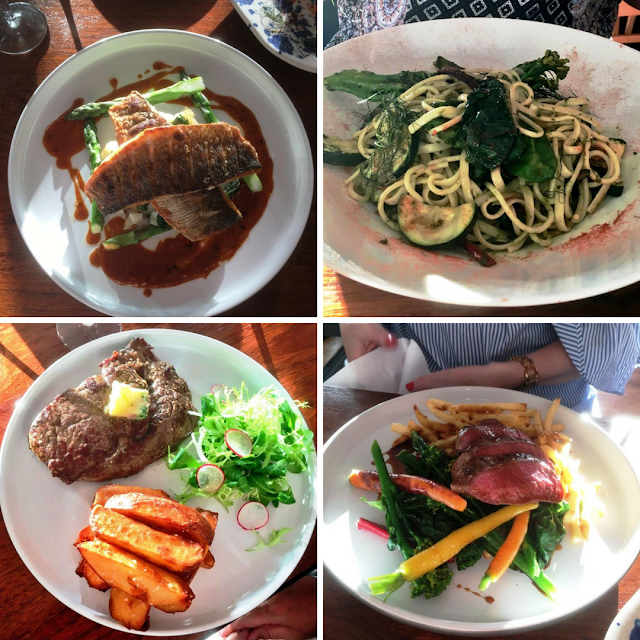 My friends opted for the vegetarian dish of Wild Garlic Pesto Linguine, Courgette, Tenderstem & Wild Mushrooms; another the Steak with Hand Cut Chips & Bistro Leaf, and the final choice from the menu was the Venison from the Specials Chalkboard. All four dishes were presented beautifully. They were also fairly large portions so we were glad we hadn't chosen starters as we had our eye on certain desserts for later! All four dishes are highly recommended too. There was nothing left on our plates. Utterly delicious. Our friend had been so right about the food. However, we had left just enough room for pudding. There was a choice of four desserts. three sweet ones plus a cheeseboard with cheese from Northumberland and France. However, we all opted for a sweet dessert. Two of my friends chose the recommended dessert of Bistro Sticky Toffee Pudding and Vanilla Cream; the other the Lemon Posset, Berry Coulis & Shortbread Crumb; while I went for the Bitter Chocolate Tart and Foraged Berries - it was delicious. Chocolatey but not too sweet and perfectly accompanied by really tasty berries. All three desserts I'd be happy to eat again. 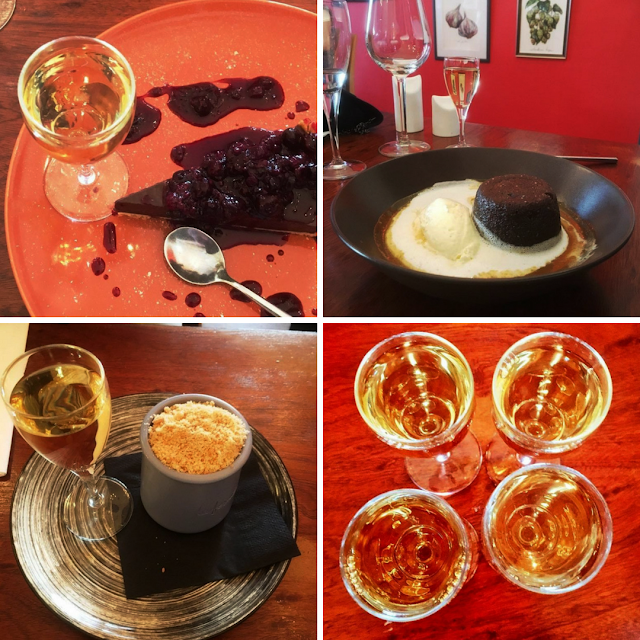 The Prosecco had been flowing as had the chat and conversation but we had noticed that you could add a glass of port or dessert wine for just £2 extra - so we did. A great was to finish off a meal. After we finished dessert we took our drinks outside and enjoyed the remainder of a very warm, summers evening before travelling home by Metro. It had been a fun filled evening. The sun shone, the drinks flowed. The company was so entertaining - there were a lot of laughs. And the food and service were amazing. I'll definitely be returning to Bistro 46. Situated on Brentwood Avenue, close to West Jesmond Metro, Bistro Forty Six is a family run modern British bistro serving a frequently changing menu of local seafood and game complemented by homemade stocks, sauces, pickles and chutneys. They have small but perfectly formed wine list and a selection of mostly regional beers, paired with food as required. Have you been to Bistro 46? Disclosure: We received a free glass of Prosecco as a result of my tweet but paid for all of our food and other drinks. We were under no obligation to write about our evening. I have chosen to because we enjoyed the evening and food so much! 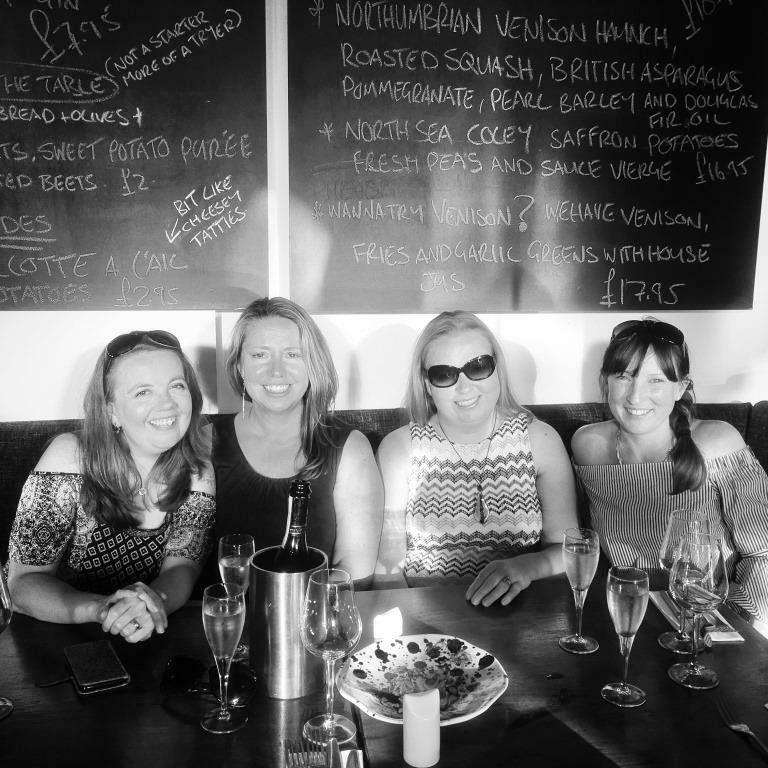 Oh it looks gorgeous - love that you were gifted a glass of Prosecco too - the perfect start to a girls night out. The Bistro looks lovely! and the food looks delicious. i do love discovering new places to eat especially with friends! Ooh it looks lovely, not been to Jesmond in ages but I want to go and check out the Oliver bonas store soon so now I have a new place to try for food too! Sounds like a lovely night out and the food looks so yummy!